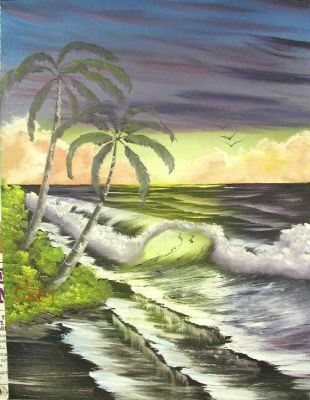 Title: High Tide ...............This painting is found in the Bob Ross Joy of Painting, Series #16, Lesson #08. We will create this seascape oil painting on canvas using the Bob Ross methods of wet on wet painting. The brushes and materials were formulated for this specific type of painting. The class starts with a brief familiarization of the use and care of the various tools. The painting will be done in a step-by-step process, with the instructor checking the progress of each student as it develops. The painting should be completed in one single session, ready to take home. Each session is a separate and complete painting in all of the Bob Ross classes. Bob Ross classes are only taught by certified instructors that have been trained by Bob Ross Teaching Instructors to maintain the quality you have come to expect from the television lessons. Every effort is made to maintain Bob's methods and philosophy of students finding the "Joy of Painting" in this instruction. Copyright 2002-2003 Michael P. Gosnell, all rights reserved.